For Dr. Rajendra Prasad, who was the first president of India, every word seems small such is his charisma and love in people. Not only he was a great political leader but his contribution towards Indian Freedom is also noteworthy. Being highly influenced by the beliefs of Mahatma Gandhi, Dr. Prasad became supporter of Mahatma Gandhi’s beliefs and thinking. He was among prominent leaders of the nationalist Movement. He left his lucrative career to free India and was among the ones who contributed a lot for designing the Indian constitution. 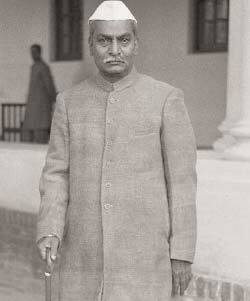 Dr. Rajendra Prasad was born on 3 December 1884 in Ziradei of Bihar. His father’s name was Mahadev Sahai and mother was Kamleshwari Devi. He was the youngest of his siblings. Mahadev Sahai was a scholar of Persian and Sanskrit languages. Dr. Prasad had great affection for his mother and elder brother. He got married at the age of 12 only with Rajbanshi Devi. He was a talented student. He got the first position in the entrance examination of the University of Calcutta and was given a monthly scholarship of 30 rupees. In 1902, he joined the famous Calcutta Presidency College. Here his teachers were none other than Jagdish Chandra Bose and Prafulla Chandra Roy. Later, he left the science and completed his MA in Economics and Masters in law. In the meantime, in the year 1905, Rajendra Prasad joined the Swadeshi movement on the advice of his elder brother Mahendra. He was also associated with ‘Don Society’ run by Satish Chandra Mukherjee and sister Nivedita. In 1937, He completed his Doctorate degree from Allahabad University. The arrival of Mahatma Gandhi on the Indian National Forum greatly influenced Rajendra Prasad. When Gandhiji was on a mission to find facts in Champaran district of Bihar, he asked Rajendra Prasad to come to there to help them. He was greatly impressed by Gandhiji’s dedication, faith, and courage. Dr. Rajendra Prasad’s view changed with the influence of Gandhiji. He actively participated in the non-cooperation movement. He became the strong Supporter of Mahatma Gandhi. He was arrested in 1930 while attending the Salt Satyagraha. Two days after being released from jail, Rajendra Prasad got involved in collecting money for Bihar earthquake and taking relief work. He had collected about three million eight thousand rupees and Viceroy could get only one-third of this amount. The manner in which the relief work was arranged proved the skill of Dr. Rajendra Prasad. Dr. Rajendra Prasad was elected as the President of the Indian National Congress for the Bombay Session. He was elected as the President of the Congress after the resignation of Netaji Subhash Chandra Bose in 1939. After two and a half years of independence, the constitution of independent India was enacted on 26 January 1950 and Dr. Rajendra Prasad was elected as the first President of India. He exercised his powers in the form of a President with great discretion and welfare for people. Dr. Rajendra Prasad retired in the year 1962 after 12 years of his tenure as President. This great person was awarded the country’s highest civilian honor ‘Bharat Ratna’. In his honour many monuments and roads are made in the nation. To mark the 125th birth Anniversary of Dr. Rajendra Prasad, RBI coined Rs 5 coin having his photo and name at the back of the coin. There are a lot of great thoughts which our beloved First President of India has expressed. Some of them are mentioned. “I believe Homeopathy as a system of cure has great scope in a poor country like India and deserves encouragement”. Dr. Rajendra Prasad died on 28th February 1963 after suffering from illness for 6 months. He spent his last few days in Sadaqat Ashram situated in Patna.